Has your door seen better days? Perhaps it rattles whenever there's a wind, or scuffs the floor every time your try to open it. If you live in a period property and are lucky enough to have original doors, every effort should be made to retain and repair them. This includes the architraves and fittings, such as hinges, latches, handles, fingerplates and curtain portieres. We offer simple solutions to common internal door issues – read our guide on maintaining original doors and windows. 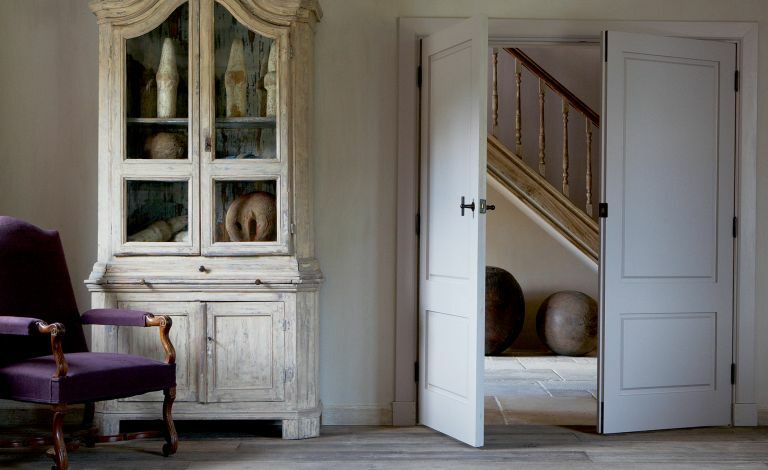 Find advice on choosing a new door when yours is past salvaging, too. A door that rattles in the wind is a door that is too loose-fitting. The reason could be that the door has been badly positioned, or the strike plate is not where it should be.To fix this problem, you can pack a hinge out with cut-to-size cardboard. Simply cut a piece of cardboard to the size of the hinge leaf, unscrew the hinge, pad it out, and screw it back in. Continue adding layers of cardboard until the door opens and closes smoothly. A door that sticks is a pain, but it can also damage your flooring if it's constantly scuffing it. Fear not, though: this problem usually has a simple solution - tightening the hinges. Use a hand screwdriver to avoid damaging the screws. Determine where your door is sticking: if your door is grating against the frame, tighten the top, middle, or bottom hinge. Be careful, however, if the problem is located in the top edge of the frame, as tightening the hinges may make the situation worse. If your door itself has warped over time, you can try adjusting the door stop - the vertical strip that runs along the casing of your door. You will need to carefully remove it with a crowbar and re-position it to fit the warping of the door. Alternatively, you can hire a specialist to try and reduce the warping in the door itself, but this is a costly and time-consuming option, and is only worth if your door is a design feature in a period home. Doors squeak when the hinges or latch become stiff. This problem is easily solved with a spray lubricant: just make sure you open and close the door several times immediately after spraying on hinges. Wipe off any excess with a cloth. The more adjustments you make to the positioning of your door, the greater the chance that over time, the lock will become misaligned with the strike plate. The solution will depend on how bad the problem is. To fix a slight misalignment, you can usually fix the problem by enlarging the cut-out area in the strike plate with a file. For a significant misalignment, the strike plate will have to be removed and re-positioned to fit where your latch currently sits. Simply mark the match with some chalk and open and close the door a few times, to see where the strike plate should be. Drill new pilot holes and re-attach the plate. Doors that are damaged are best left to a professional to fix. A good carpenter, where necessary, will normally be able to repair a damaged door. For example, panels sometimes split due to years of paint accumulation inhibiting movement, but it is possible for them to be re-glued or for timber ‘splines’ to be inserted into the gaps. People often wonder whether they should strip old doors. The general answer is: don’t. This recent fashion is usually historically inappropriate, frequently exposes knotty timber intended to be hidden, and can cause damage. Sandblasting spoils the surface of timber and dipping in ‘acid baths’ may raise the grain and, by softening the glue, weaken joints. It is generally inadvisable to apply linseed oil, stain or varnish to unpainted oak doors. If considered vital, beeswax and turpentine can be applied to unpainted oak inside. Where there is no option but to replace a door – perhaps an inappropriate modern insertion – the new one may need to be specially made. It does not have to copy any surviving original doors, although it should suit the style of the house. New door openings are usually best formed towards the corners of rooms, to maximise space. Allow a visually acceptable margin at wall ends and bear in mind that a non-standard door size may be most appropriate.